Civilised start time for Goldalming and the promise(?) of croissant is an added bonus. Even the weather forecast had improved so no excuses – the ride is on. A warm welcome from Mark accompanied by tea and biscuits is forthcoming on arrival and some new faces – we are going to be joined by two Fleet cyclists. The regulars slowly arrive but it does take some serious prodding to get the second cuppa and to make the croissant appear requires feats of which I am barely capable at that time of Sunday morning – but I am rewarded for my efforts. Then the prodding is the other way – you lot should get going. Yes Mr Chairman – anything you say! It should be noted that Clive is remodelling himself – he was early! Yup, I will repeat that just in case you missed it. Clive was early. Even Bob’s wife commented on it and she just came for the croissants (wise woman). 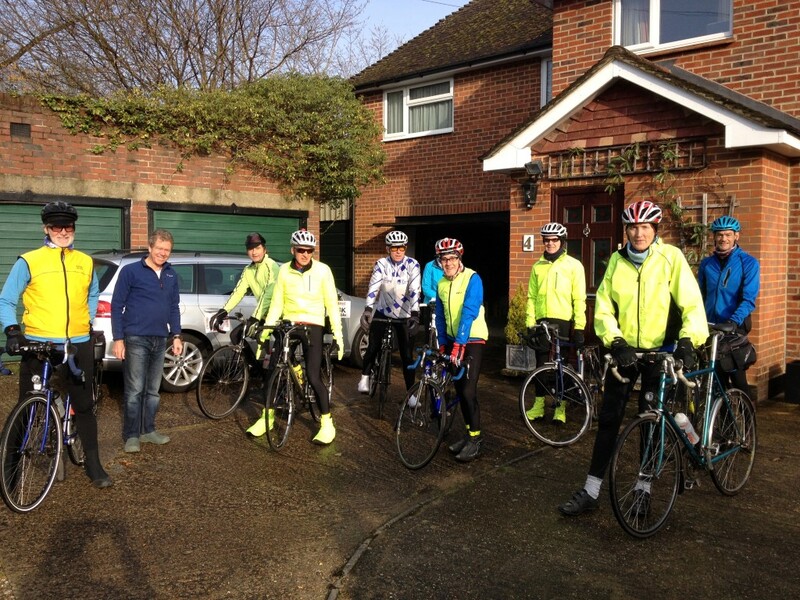 Then Clive was telling our new friends that the Alderbrook Road climb was the easiest on the route. Not in my books it isn’t, it’s one of the worst. And when we got back he suggested that the two who hadn’t cycled with us had arrived back way before us. No chance – we went at a reasonable lick and only one solo cyclist overtook us and he didn’t like it when I caught up with him and overtook him on Leith Hill Road. Who says lightening doesn’t strike twice? When we reached Rooks Hill, Steve of Fleet Cycles reported that his freehub was seriously playing up and he was very concerned. The pawls weren’t engaging properly. So he bailed out and headed for his car and home. Ann had the same problem the week before and had to bail out and get the train home from Farnham. Surrey roads taking their toll on our wheels? My front wheel bearings are beginning to make ominous noises. Anyone know if Mavic sealed hubs can be serviced easily? The rest of the outbound journey was uneventful though bad memories at the top of Leith Hill – took it very carefully. At the control point the thought did occur to me that I should take a photograph of the notice board – actually that’s what a pair of walkers was doing – and then I would not need to go there again. But that would defeat the whole thing. The return leg was going very well too and Clive’s puncture on Thorncombe Street was amenable to a few pumpings up to get us back rather than an inner tube change. Mare Lane is a tough one – need serious gears for that one. The Sturmey Archer was not quite up that challenge but you must have amazing knees Paul to cope as well as you did. 4 hours and 5 mins after setting out we rang the doorbell only to be told we were early! Tea please and more biscuits. Only this year we did not demolish the whole tin. In fact we were almost in danger of sitting down and watching the whole of the England-Italy match in Rome in the 6 Nations. (Personally I find watching England too painful but I hear that they did very well this time). For those of you who decided not to come because of the weather – you missed a really good ride and the weather was very kind to us. It was sunny and almost warm. It did cool down in the last hour and threaten rain but it held off and I was able to get home and wash the bike down and it still hadn’t rained. Now, if only the ride came with a complementary bike wash at the end as I still have the chain and cassette to do but my hands were so cold.